Since I write a homesteading/gardening blog you could get the impression that I am a hard working gardener, always on top of things. Well, that is not true, and I feel that I have to apologize if I have given you this false impression. The truth is that I am a weak, sometimes sick, and a bit lazy gardener. That being said, I do enjoy gardening and we grow a lot of food year after year. And every year I learn a bit more on how to successfully garden the easy way. Here are some of the things that we have learned so far. Note: this post is not for the hard-working, traditional gardener. If you enjoy what you do, good for you. I am not saying that everyone should garden the easy way. Some really enjoy all the work and the look of a worked garden. 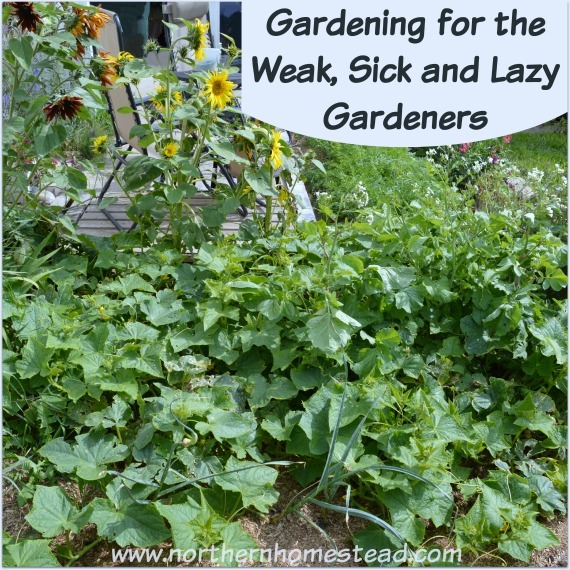 Here are 7 practical things to make gardening for the weak, sick, and lazy gardeners more enjoyable and successful. Proven gardening methods anyone can do. Well, we do not even own a tiller and I can’t dig, even if I would want to. I have a hard time getting a spade into the ground. If something needs to be dug in our garden, Jakob has to come do it. I prefer to work with a hand spade. And in most cases it is all that needs to be done anyways. We use ‘no till garden’ methods; it was work to set it up, but so worth it. See how we replaced our lawn with food production, and converted a hay field into a garden. If you use raised beds, hills, or a simple garden area, do not till it. Constant tilling only hardens the soil and creates more work. A ‘no till garden’ gets better over time because beneficial insects and bacteria take over the work for you. Read also to till or not to till the garden. This goes along with no tilling. Look around in nature, there is no naked and exposed soil. It is always covered. I think that is why God made the leaves fall in the Autumn, so the ground gets a cover. Covered soil stays moist and soft. Learn more at no till gardening methods. If you can, find great organic mulch like wood chips, straw, or leaves to cover your garden with. But if you have no access to those kinds of mulch, cover with newspapers, a Plant Protection Blanket , or Weed Control Fabric. The natural mulch has an advantage in that it decomposes and enriches the soil, but any cover is better than no cover. So yes, cover the ground. Single row gardens can look beautiful, if worked hard. If covered well, they can function with less work. Even less work is needed if there is no room for weeds to grow and for a tiller to go through. Plus, plants support each other. Plant squash and spinach together, cabbage and beets, cucumbers and radish. Before the bigger plant will need the space, the small one will be harvested, but you will not have to pull weeds in the process. If the ground is not covered by useful plants or mulch, then the weeds will try to take over. It’s a natural mechanism to protect the dirt from the heat of the sun. Also get yourself some knee pads or a bench to make the planting more enjoyably. If you do not want to weed, stop hoeing the garden. What happens if you hoe the garden: weeds that propagate by seeds will bring more seeds to the surface, the hoed ground is ideal for them to germinate and grow. Weeds that propagate by roots will be multiplied. Every time you chop a root, you create a new plant. Hoeing creates more and more weeds. What can you do instead? The best way to kill weeds, or any plant for this matter, is by cutting off the top. A plant that has no leaves above the ground will die. It simply starves the roots to death because no photosynthesis is taking place. I like to use a hand tool that looks a bit like this, my is homemade though. See more at How to deal with garden weeds. Composting can be a lot of work in an organic garden. It does not have to be, though. There are easy ways to simplify composting. If you have chickens, let them do the work. A true deep litter method creates a great compost. All the garden waste is processed by the chickens. If you do not have chickens, turn your potato bed into a passive compost pile. Potatoes need to be hilled anyways, why not hill them with garden waste. They will not mind and grow tall and cover the mess nicely. When done, cover the messy bed with some weed control fabric. Next spring it will be a great squash bed. Squash likes to have warm feet, if there is still composting happening it will make the plants even happier. Now plant your potatoes in another bed that needs some soil improvement. If you don’t grow potatoes, start a compost bin. Layering green and brown will prevent the bin from smelling and it will compost on its own, just give it enough time. If you followed so far, you will notice that watering is really not needed, except if spring is hot and dry to establish young plants. When transplanting seedlings, water the hole before planting the seedling so the roots will grow deep to reach the water. If you plant the seedling into a dry hole and water from above, the plant will develop shallow roots, always looking for more water. Deep watering young plants helps them find moisture in deep soil on their own. The mulch helps to keep the moisture in the soil. Watering, in most cases, is not needed any longer. See also how to water your vegetable garden. Even a easy garden does not get done by sitting in a rocking chair. No, you have to go out there and do something. As you see, there is not much to do. But little by little, if not taken care of, it can become too much for a weak gardener. If you spend about 20-60 minutes each day in your garden, you will never have to work your garden much. Plant a bit, harvest a bit, take care of some weeds, some compost, some pruning. I personally hardly ever work beyond having fun. Come join me by becoming a easy gardener as well. You will see how much fun and rewarding gardening can be. Here are some good information on less work gardening methods. Love tip number 5, would have never thought of that…. You mean the potato compost bed? I learned this from the Russians, but have not tried it myself. We always outsource our potato growing to a farm garden. And we have chickens to do the composting for us. But I know it works, since thrown away potatoes grow well on compost piles ;). Try it and let me know how it goes. By the way, I like to learn from the Russians, their climate is similar to ours, and they have been gardening for centuries. not just for the weak, sick and lazy. Those that are too busy will also benefit. Oh yes, busyness is just an excuse not to garden. Gardening can be so little work and brings so much. Great ideas! I am all for number 2! It definitely keeps the weeds at bay! We use the deep litter method too. I just cleaned out my guinea coop this week and into the garden it went! Thanks for linking up with Green Thumb Thursday! I hope you’ll join us this week too! Covering the ground makes all the difference, doesn’t it. Wow! Just sent this to my husband. We are going about weed control the wrong way! So many do, hope it helps you to find a better way. Thank you for this, Anna! I have so little energy, but so love my gardens. I’m pretty good at the first 3, so now I have 4 more strategies to use. You are so welcome, hope it helps you to enjoy gardening even more. Thank you Christine for your kind words. I do not think that ill and weak people are lazy, but it is great to know that they can maintain a garden the lazy way. Happy gardening! Bonjour Anna! J’aime votre philosophie et vos bon conseils…Je vis au Canada aussi mais au Québec, en zone 4…donc un peu plus facile pour moi pour la chaleur. Par contre, je vis avec un handicap et je trouve toujours de bons trucs pour vivre mes passions, dont le jardinage! Merci de prendre du temps pour partager… Moi aussi j’adore le numéro 5! Vive les russes!!! Thank you Yolanda, glad you are able to garden with your disability. Yes, the Russian do have some amazing gardening and also preserving tips. I’m glad they have discovered the internet too, so we can learn from them. Thankyou for info. I am disabled. I use to be an avid gardener but have given up most of my favorite activities. Sorry to hear Charlie, this must be very hard on you. Hope you get some nice gardens in the neighborhood to visit and enjoy in the summer.